One New Year's resolution is to finish some kits that got stalled along the way. 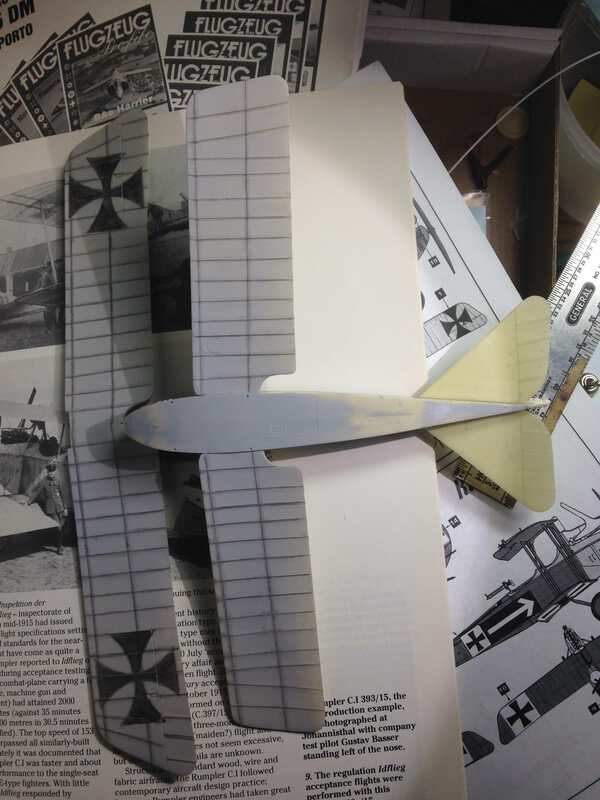 Planet Rumpler is a resin kit that arrived with warped fuselage halves, warped wings, no instrument panel and several pin holes in the engine louvers. But its an attractive, early war German two-seater so its made its way back on the work bench. I spent considerable time trying to hid the upper deck seam and after numerous coats of putty, Tamiya fine surface primer, various grades of sand paper it looks fine. Sanded down the rib tapes as I thought they looked a little over stated. Got a new air brush compressor two days ago that's very quiet and now waiting on a Mr. Gunze paint booth to arrive. Then I can paint year round and bump up my kit production. The wing struts on this kit are also resin and the prototype ones are very thin so will replace with some brass ones. Still need clearance from my eye doctor to get back to my 'normal' physical duties so I can't use my brass sheer device to make the struts until he sees me. Am sure I can keep myself entertained making up the cockpit parts until then. Like I outlined you'll have to deal with the warped fuselage halves (boiling water and a flat surface fixed), warped wings (hair dryer fixed), minor bubble holes in the resin (putty to the rescue), resin struts that are the wrong shape (am going to replace with brass), very minor interior parts (scratch-building what's needed) and the rib tapes are overstated (lightly sanded to reduce). On the plus side; wonderful decals for two a/c, wings and tail feathers castings are thin and a nice sheet of PE for seat belts and MGs. Typical of resin kits the lower wings need to be pinned with brass wire for strength and most my building time will be making new struts. Don't worry, Baldrick has a cunning plan !! I am looking forward to seeing this one done, looks amazing so far. When you have the time, can you show us your method for making the new brass stuts? I have several resin plane waiting and my supply of strutz brass profiles is getting very low... would love to have some more ideas or options for that! I wish I had an inexpensive method I could pass along for making brass struts by t don't. About 20 years ago a friend and modeler gave me a metal sheer that weights about 30 pounds and will cut brass sheet in thin strips. I just cut a number of strips and the file the edges round to make up the struts. This may turn out to be a flop but I want to show the CDL with the ribs and national markings showing on the underside of the wings. I'll spray the model with an ivory color and hopefully these will show through the paint. I actually bought some brass tube and wire to use this method initially but the Rumpler C.I struts are very small in their cross section. I'll try my initial method and use this as a fallback. An outstanding piece of work to date Charlie! This one is looking fabulous! I drew in the wing structure and national marking with a black pencil and over sprayed with a off white paint this week. I'll redo the lower wings but am ok with how the top wing came out. 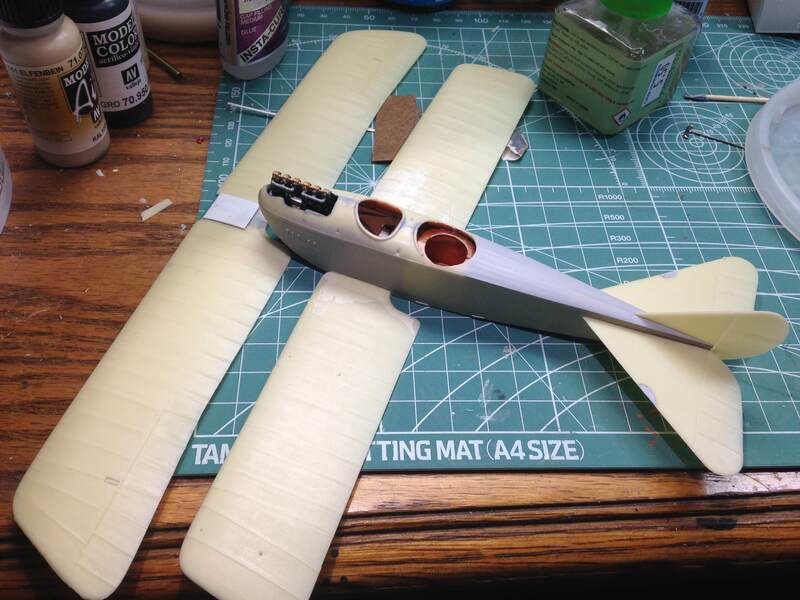 Got in some copper and brass rods this week and am going to tackle the wings struts next. 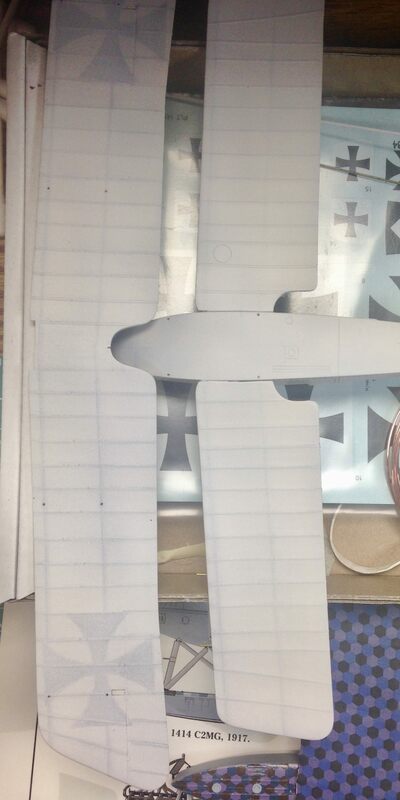 The naval hex peaking below the Rumpler is the W.12 I'm working on at the same time. Why not torture oneself with building two resin kits at the same time? Very fine work on the wings, Charlie! And glad to see you back on the W.12! Excellent translucency effect on the wings Charlie!